The “Geo #98” mural is complete and ready to head to the San Diego Museum of Art for BLOOM BASH 2019! Panels stacked, car packed & that’s a wrap here at the Pacific Event Productions studio . 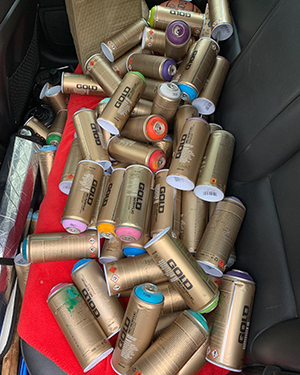 It’s been an intense month of creative focus and staying hydrated while working on the 176 ft. mural to be suspended from the roofline of Panama 66 during “Bloom Bash” at the San Diego Museum of Art . 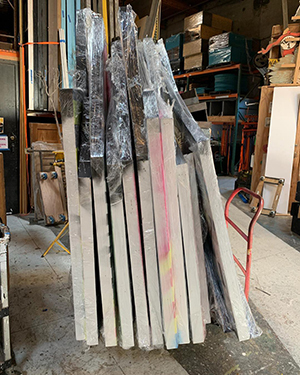 The 44 panels will now be transported to Balboa Park and installed for #artalive 2019. Bloom Bash tickets are on sale at sdmart.org/artalive so grab your tickets before the event sells out! Details and links in “Exhibits” on montymontgomeryart.com and also visit @sandiegomuseumofart https://www.instagram.com/sandiegomuseumofart/ and @sdmasocial https://www.instagram.com/sdmasocial/ for more info on the event. Thank you to the #SDMA Family and to the PEP Creative group for the support over this last month as the “Geo #98” mural was created. 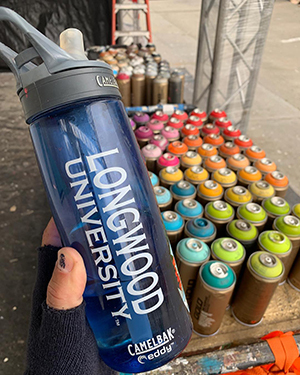 *Mural images will be released after the opening party on April 12, 2019 7pm – 12am. Hope to see you there! 📸 : https://www.instagram.com/polychromist/ .